A man slashed the face of a woman and racially abused her after she told him his headphones were hanging from his pocket, a court heard. 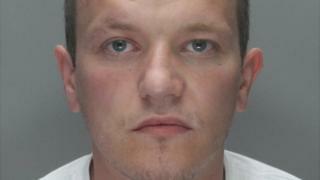 John Kavanagh, 31, was jailed for 11 years by Liverpool Crown Court for racially aggravated assault. The knife attack on 3 June last year "came out of the blue" and CCTV footage was described in court as "chilling". Kavanagh, of Dial Street, Kensington, who denied the charge, will also serve two years on licence. He was walking along Holt Road, Kensington mid-afternoon when the passer-by told him the headphones were trailing from his pocket. His response was to make racist comments and follow her down the street and slash her face with a knife, said police. The woman suffered a head wound and a black eye. Kavanagh was quickly arrested following a media appeal using CCTV footage. Det Con Baker said he hoped the length of the sentence was of some comfort to the victim. "The victim in this case was only trying to be helpful but Kavanagh directed a stream of racist abuse towards her then slashed her across the forehead." He added: "Today, the judge in court described the CCTV footage as chilling and I'd like to take this opportunity to thank the media and the public for their help with the original CCTV appeal which helped to bring this man to justice."